The frequent co-stars re-team for a pitch-black romantic comedy about two outcasts who meet cute at an ill-fated wedding (and then try not to screw it up). There are other characters in Victor Levin’s “Destination Wedding” beyond Frank (Keanu Reeves) and Lindsay (Winona Ryder), but none of them matter or get a moment of screen time beyond filling space in a wide shot. Not the dim bride, or the thoughtless groom, or the cold mother-in-law; the only people who matter are Frank and Lindsay, and so it’s only fitting that when “Destination Wedding” opens, it comes with an amusing subtitle: “A Narcissist Can’t Die Because Then the Entire World Would End.” And, yes, this is a romantic comedy. Levin’s film, his first since the 2014 Anton Yelchin romantic drama “5 to 7,” will feel familiar to rom-com fans, though the filmmaker lets Reeves and Ryder rip into characters who would be pushed to the side in fluffier films. Most of all, “Destination Wedding” makes the case that the two-hander isn’t dead, even if it struggles a bit when forced to come to a neat, movie-ready conclusion. Introductions are swift: Frank sits on the edge of his bed, obnoxiously clearing his throat while watching chattering cable news, while across town Lindsay gently whispers to a plant to please not die while she’s away. They’ve got the kinds of lonely lives that don’t suggest romantic leads you want to root for. But, of course, you do want to root for them, because it’s Reeves and Ryder. Two of Hollywood’s most enduringly charming stars can bear a lot of misanthropy. They’re soon brought together in what seems like a traditional meet-cute: at a tiny airport, where they’re expected to sit next to each other on a tiny plane and fly to a tiny wedding filled with (metaphorically) tiny people. Their first interaction isn’t a sweet one: They hate each other on sight. But of course Frank and Lindsay are much more alike than they’d like to think, and Levin’s clever script plunges them into an instant rapport that only gets better as the film winds on. Soon, Levin gets down to the romantic hijinks as Frank and Lindsay realize that they’re not total strangers and their placement on said tiny plane isn’t a coincidence. They are headed to the same wedding, an event that contains annoyances for both of them: Frank’s jerky half-brother is the one getting married, and Lindsay happens to be the girl he jilted six years earlier. They’re the strange spare guests, thrown together because no one else has any idea what to do with them (a somewhat similar premise to the Duplass brothers-produced Sundance premiere “Table 19”). 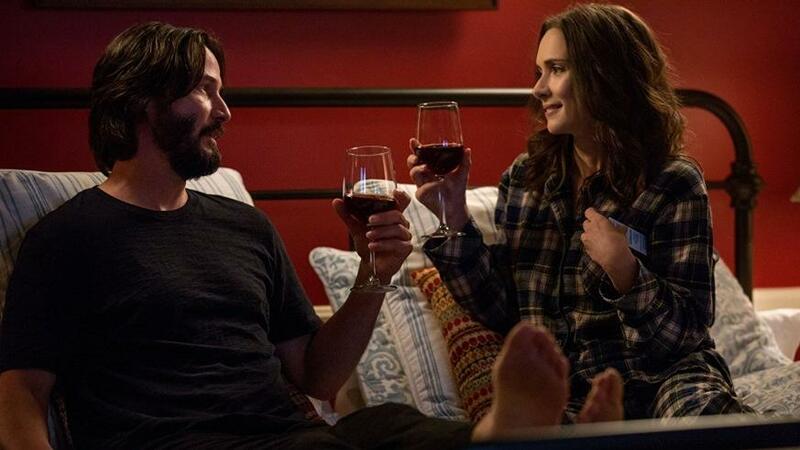 While Levin stays focused on the pair — no one else in the film gets away with an audible line and Reeves and Ryder fill nearly every shot — he also finds the time to poke fun at the entire destination wedding cottage industry. Fans of off-kilter rom-coms will likely enjoy the film, but anyone who has ever been forced to get on a plane to watch two people get married on top of a mountain are going to love it, and that’s long before Levin does more damage to the post-wedding brunch than even the most hungover wedding guest. Unable and unwilling to mingle with anyone else, Frank and Lindsay muddle their way through the over-the-top wedding events, keeping up near-constant banter. Not quite narcissists, but very into themselves, they suddenly find themselves enjoying the company of another person. A strange event at the sunset wedding pushes Frank and Lindsay into goofy territory, though Reeves and Ryder are so appealing that they almost make it work. It also breeds the film’s best sequence, in which the pair basically litigates their maybe-romance from the confines of a hotel bed filled with expensive minibar snacks. It’s the kind of conversation not often heard in rom-coms — wait, is this what falling in love is actually like? — and the raw honesty, smashed up against their unexpected bond, proves satisfying. Maybe this is what falling in love is like, and it’s high time that rom-coms had the space for weirdos like these. “Destination Wedding” opens in theaters August 31.